Knowing my time was limited because of (ahem), the chicken terracing project, I didn’t sign up as a minion. (SOB!) A minion works with co-hosts of the Challenge, promotes the challenge, visits 20-30+ websites/week to eliminate spammers or dubious websites (the kind that spread viruses), checks if they are participating in the challenge, and writes love note comments. I kept thinking that if I could just manage to write a few posts ahead of time, I could be a last minute minion, but it never happened. Skimpy social media. I was trying to keep up each day. Therefore, minimal mention on my Facebook page, no effort whatsoever on Instagram or Google +, and ignored twitter. I didn’t even visit the A to Challenge Facebook page. Social media felt like work. My theme on Places on Maui wasn’t as fun or silly as last year’s Beginner Survival Guide to Maui. Blogs from the end of the A to Z sign up list were not reciprocating comments. They were probably all newbies, trying to keep up. On the other hand, I was grateful for not having an onslaught of comments, and the effort of reciprocating them because of my limited time. Yet, days passed by with zero or only one or two comments. Somehow Photoshop Elements decided to not work, so I had to use Canva. While I had a reading list of blogs from previous A to Z Challenges using Google Reader and Bloglovin, and was reconnecting with familiar bloggers, it wasn’t as exciting as connecting with some wonderful new writers or bloggers. AND, the horrible realization that I had over-relied on picasa’s photo management program. Since picasa arranged my photos in chronological folders which gave them the semblance of neatness, I had become lax about labeling my photos. I spent hours looking for a photo which was perfect for a blog post, but could NOT find it. So I needed to better organize my photos. 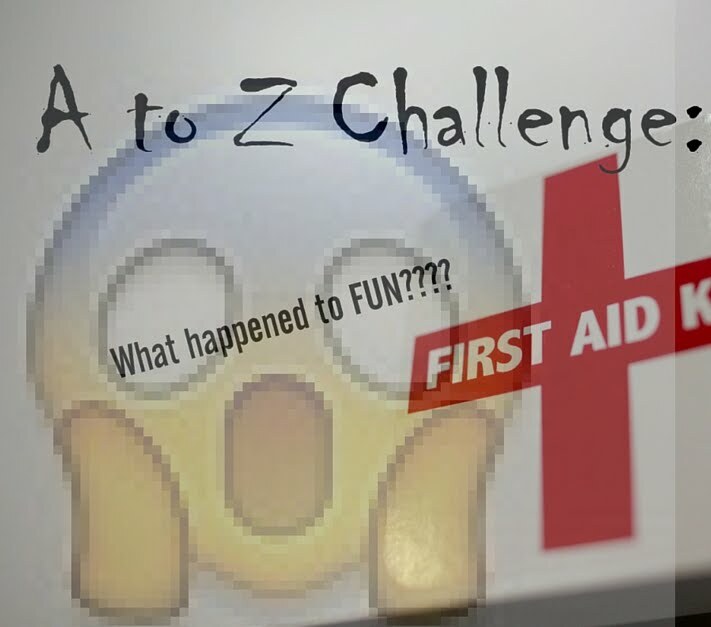 Oh no, the A to Z Challenge was feeling like WORK! Add one grumpy husband to the mix and it was going to be a long April. How to make the Challenge FUN? Twitter – After visiting a Storydam (#storydam) chat on twitter one Thursday afternoon (8 pm EST), I found out that the A to Z Challenge chat (#azchat) on twitter was still happening. I thought that the #azchat would stop in April since everyone would be blogging and hopping. Doing #azchat was like a jolt of energy to connect with people and find blogs who were actively commenting. Letting go of the idea of trying to post on time, or first thing in the morning. Having been a minion last year, I knew there was some leeway with the posting schedule. As long as one tries to keep up and gives a reason why one is behind, the A to Z team is pretty mellow. I decided to “be in the flow” with my life away from the computer. Being late and otherwise balanced in my non-blogging life (and having a happier husband) was better than posting on time. @hmgardner, @lisa_n8ltg, @thejoyousliving, @lgkeltner, @jlennidorner, @mollyscanopy, @pamlovesbooks, @dreamsofnyssa for a fun twitter chat and for blog comments. There are many other tweeps who participated – I’m not deliberately leaving any one out, there are too many to mention! (I will try to update this later with HTML links). @knottymarie, @golfnovels, @xrsdance, @jluckylotus. I know there were others, but it's hard to keep track of everyone. Buffer – At least I could schedule a few tweets even if they out of date with the A to Z Challenge calendar. Commun.it – I had been avoiding using this for a while, but signed up and learned how to set the settings for weekly thank you tweets rather than daily tweets. Wikipedia Creative Commons. I used this for a couple of posts. UPDATE: I was using Flickr Creative Commons but recently have decided to remove all Flickr photos from my site. Picmonkey and Canva – Let me do some edits of a map photo, over and over. Google maps – learned how to embed a google map, so I am embedding like mad! I organized about 3 years of photos and discovered 500 photos of my cat. This is why my photos are not organized. I have too many cat pics. I probably have another 200 photos of my cat from 2015. If in doubt, blame the cat. Special shout out to Dan F. Miller who signed up with me for the A to Z Challenge four years ago and returned again this April. I think he got busy in April - please mob comment him. He is great about reciprocating comments. Sinamon (or Sin-A-Mon) Tales – Food blogger, currently on X. 4 more followers with Google Friend Connect/ Google Reader – not a lot, but more than 100. 20 or so Facebook followers to my page. It was a solid theme. I refer to many of these places in my blog, but have never really described these places to others because people who live on Maui know all about them. So, when people who live on Maui find the posts entertaining, that’s a good sign. The Venus Pool post stirred up some controversy by a local Maui resident. Mahalo to @gfreemaui who lives on Maui for her many comments. My favorite post was H for Haiku, the silliest post of the series. Please send me good wishes to finish this darn chicken coop, gulch terracing project! Hoping to finish it in a few months. I will have to share photos of the continuing saga.